MSI (s) (E0:E0) [15:43:58:875]: Assembly Error:The identities of the manifests are identical but their contents are different. Log file %winndir%\logs\cbs\cbs.log didn’t give more details, although it contains mnemonic error code: STATUS_SXS_MANIFEST_IDENTITY_SAME_BUT_CONTENTS_DIFFERENT. This error code means that an assembly with the same identity is already installed in the system, the versions of the installed assembly and one being installed coincide but the files differ in these assemblies. I couldn’t reproduce the failure on the machines at hand: it installs successfully and works. After a bit of investigation I found out that the Microsoft Visual C++ 2005 x64 Runtime assembly was already installed on the machines where the error occurred. I installed vcredist_x64.exe on one of my machines. Our product install started to fail afterwards. On Windows XP and Windows Server 2003 this difference didn’t cause error. On newer Windows 7 and Windows Server 2008 R2 it causes installation failure. Microsoft Connect has a description of this problem: 8.0.50727.4053 x64 CRT merge modules fails to install on x64 but ok on x86. The same message can be found on MSDN forum. This question is marked as resolved, however the answer doesn’t really resolves the issue. The message on the forum contains a link to another description of the same issue on Microsoft Connect. Neither have I found a solution or workaround to avoid install failure. The only thing is clear: Visual C++ 2005 x64 runtime can’t be installed on the same machine using both merge modules and vcredist_x64.exe. The 32 bit (x86) version of this runtime installs successfully in both cases. Have you been able to workaround the problem ? Any idea that could help my situation ? No, I haven’t… Yet I’ve got an idea how to. I’m going to move to merge modules into a separate feature and configure the package so that this feature is not installed on Windows 7 or Server 2008 R2. These systems have a newer version of this assembly (msvcr80.dll) installed; my system has version 8.0.50727.4927. I understand that it’s bad to assume a newer version is already installed. Another option would be to check whether the version you install already exists in the system and skip installation of the merge modules with the runtime if it does. I haven’t tested this workaround yet, but I think it should work. I found a solution… Microsoft recently released an update of Visual Studio which updates the required runtime(again). The new version of the merge modules (8.0.50727.5592) doesn’t appears to be affected by the same bug as version 8.0.50727.4053. All I do is installing the latest version of the runtimes which are backward compatible. This solved the issue on all computer tested. This will make my life easier too. I’ll give it a try. I’m sorry folks, but version 8.0.50727.5592 also has this problem. That’s sad news. I haven’t tested the new version myself yet. I tried only x64 version of 5592 so far, and it installs successfully both from Merge Modules and from vcredist_x64.exe. So it looks upgrading to newer version of the Visual C++ runtime libraries is a good step to resolved the issue. > In note 1375494, I already installed vcredist_x64.exe (Microsoft Visual C++ 2008 Service Pack 1 Redistributable Package (KB973552)). But even that, the error remained! This is the wrong patch – you need the patch for the Runtime 2005, not for 2008. Those kernels were build with Visual Studio 2005 and hence you need that runtime. I do not understand how this is connected to the issue described in this post. No one here tried to install updates to VC2008 to fix the issue with VC2005 libraries. It’s quite obvious that doing it won’t help. There are updated versions of the VC2005 runtime. The version 8.0.50727.5592 that is mentioned in the comments above was released on April 12, 2011 under KB2465367. 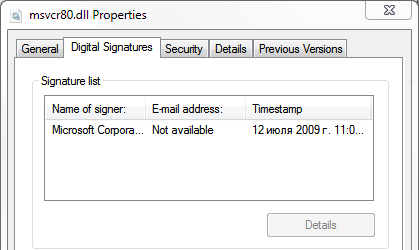 This update was superseded by KB2538218 released on June 14, 2011. The version of the libraries is 8.0.50727.6195.